Cooked foods cannot create true health because they are missing some very vital elements needed by the body for its optimal functioning; things like enzymes, oxygen, hormones, phytochemicals, bio-electrical energy and life-force. When foods are heated above 105° F they begin to lose all of these. By 118° F, most food is dead. Yes, the vitamins, minerals, carbohydrates, fats and proteins are still there, but in a greatly altered state – not at all what nature provided. Each cell of the body is like a tiny battery, and raw and living foods supply the bio-electricity which charges these batteries. The bio-electrical energy of raw food can be clearly seen in Kirlian photographs of the food. This photographic process shows electrical discharges that naturally emanate from all living things as luminescent, aura-like flares surrounding the subject. The glow is bright and radiant in raw foods, yet almost totally absent in Kirlian photographs of comparable cooked foods. To me "life-force" means "the energy that is able to create life." The sprouting ability of raw foods demonstrates the presence of the life-force within them. All grains, legumes, beans and seeds sprout. Nuts in the shell sprout. Potatoes sprout and create new potato plants. (Do not eat potato sprouts as they are poisonous.) If you stick the top part of a pineapple into water, it will sprout roots. Apple seeds create apple trees. Avocado pits and mango pits sprout. Now, take cooked versions of all the above, put them into soil and see if a plant will grow. Cooked food rots, rather than sprouts, and a new plant does not come forth. Through observation, you can easily demonstrate for yourself what you are losing by eating cooked foods. A food that is cooked cannot create life and cannot maintain the life-force energy in our bodies. Cooking food disrupts its molecular structure and kills all the enzymes too. Enzymes are the indispensable catalysts which enable the body to utilize vitamins and minerals. (Think of enzymes as the workmen and vitamins and minerals as the bricks and mortar. Without the workmen, the bricks and mortar don't get put into place.) Enzymes are extremely heat-sensitive and thus do not survive in cooked foods. The vitamins and phytochemicals also are injured, greatly diminished, and left in an altered molecular state. The minerals are made less soluble. The fats have turned from life enhancing cis fatty acids to trans fatty acids, which create damaging free radicals in the body. Trans fatty acids also interfere with respiration of the cells. The proteins (including vegetable proteins), become denatured; they then coagulate (like the white of an egg) and are very difficult to digest. Some researchers report that unmetabolized protein particles in the bloodstream are a possible cause of allergies. When you eat cooked (enzymeless) foods, you put a heavy burden on your body, which then has to produce the enzymes missing in the food. One of the reasons you feel lethargic or sleepy after a cooked meal is because the body is diverting its energy to replacing the enzymes that were not supplied. By comparison, a raw food meal leaves you feeling light and full of energy. You can judge this for yourself. Uncooked foods digest in 1/3 to 1/2 the time of cooked foods. The stress of creating and replacing enzymes, meal after meal, day after day, year after year, greatly contributes to accelerated aging. Ingesting cooked food also causes the body to produce a surge of white blood cells (leukocytosis). These cells normally defend against disease, infection and injury to the body, but their production is a routine effect of ingesting cooked foods (as if the body considers such food a threat or danger). Because leukocytes carry a variety of enzymes, there is another possible explanation for the increase in white blood cells. The leukocytes may be delivering the missing enzymes so that digestion can proceed unhindered. Leukocytosis does not occur when raw, unheated foods are eaten. A ccording to Viktoras Kulvinskas,5 "in any pathological condition, including the intoxification of the digestive system with cooked food or other toxic materials, these white cells increase from 5 or 6 thousand per cubic millimeter to 7, 8 or 9 thousand per cu.m.m." Leukocytosis also occurs when additives, pesticides and chemically based supplements are ingested. And, of course, producing these cells creates an additional stress upon the body. Raw foods are full of oxygen, especially green leafy vegetables which contain an abundance of chlorophyll. The chemical structure of chlorophyll is almost identical to the hemoglobin in our red blood cells. The only difference is that the hemoglobin molecule has iron in its nucleus and the chlorophyll molecule has magnesium. Chlorophyll detoxifies the bloodstream and every other part of the body better than anything else you could eat. When you eat raw green chlorophyll foods, you oxygenate the blood. The bloodstream, through its capillary system, then delivers this oxygen to every cell in your body. And when you eat greens in blended form, such as in Dr. Ann’s Energy Soups (se e Recipe Index), this process is even more efficient. Sprouted seeds contain vital elements which nourish our glands, nerves and brain. The hormones needed by the body are created out of the natural fat and other essential principles found in seeds. Think about how few seeds are found in the average diet. The plant breeders are hybridizing most of the seeds out of our foods. Now we can get seedless watermelons, seedless grapes, seedless citrus, and the list goes on. Even if we did find a seed, most of us don't understand the value of eating it and thus, it would be discarded. Cellulose – the woody, fibrous part of food – was previously believed to be unnecessary to the body. Because the body did not absorb it, it wasn't deemed important. Now we know that this fiber is what keeps things moving through our body so that we don't become constipated. Nature is vindicated again! I believe, in addition, that raw fiber has the ability to act as a broom which sweeps the intestinal tract and keeps it clean. Cooked fiber has lost the ability to do this for us. Enemas and colonics serve their purpose, but they are a poor substitute for what nature, by putting (raw) fiber into foods, has provided. Raw and live foods nourish and improve the body's inner environment. 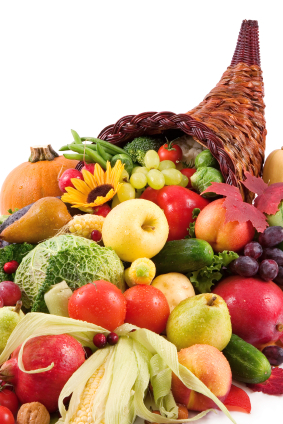 Raw and live foods enable the body to dislodge and expel accumulated wastes. A member of my family had a tiny sliver of metal lodged in his hand as a result of an accident. For two years he tried to get it out by squeezing, pushing, and probing with sterilized needles, etc., but it wouldn't budge. He went to the Optimum Health Institute (to learn about live foods) for a week and, when he returned home, decided he would continue on raw foods. Four weeks later, a bubble formed on his hand and inside the bubble was the sliver of metal. This is an example of what raw and live foods do. If something is not supposed to be in your body, it will be expelled. Eating cooked food prevents the immune system from working on what is really important in keeping us superbly healthy and young in body, mind and soul. We exhaust and dissipate the body's strength by using the immune system to combat the unnatural cooked foods, chemically based supplements, pesticides, herbicides, fungicides, hormones (in meats, poultry, fish and dairy) and numerous other toxins we ingest, breathe in or absorb through our skin. When we really need the immune system to support us (as when a disease or infection develops or an injury occurs), it then lacks the strength to defend us properly. Eating healthy means giving your body power foods it can easily assimilate and use for regeneration and rejuvenation. Life comes from life. So the more foods you eat which are organic and straight from nature's raw gar den, the better you are going to feel. Throw everything into the food processor and process until smooth. Serve on romaine leaves, as a celery “stuffing”, with carrot sticks, cucumbers, you get the picture. Note: This is pretty rich so try to contain yourself and not eat too much. I have figured up that one tablespoon is my serving size and that has five grams of fat. Put the almonds to soak a day ahead and change the water once. I keep them on the cabinet, covered. When they have been drained, put them through a Champion juicer with the blank in place. This takes some strength. Put the onion through along with the elephant garlic. If some of it doesn’t get processed, no problem. Take the resulting paste and all the stuff that’s left in the juicer and chuck it into a food processor. I put in maybe a half teaspoon sea salt, several sprinkles of chili powder and cumin to taste. It was quite thick so I thinned it down with water. Make it whatever consistency you want. It could be anything from a spread to a dip. One of the other ladies brought some salsa (not raw) to go with it. If I’d had time, I would have made some. I’ll have to do that at a later date. Serve on romaine leaves. And here’s where I do something different. The original recipe doesn’t call for water but I put water in the blender just over the nuts. Another thing I do that’s different is I use dill that I’ve frozen in ice cubes. That’s how I keep my basil, too. Blend it up. Can store up to 2 weeks in fridge. Feel free to vary any of the ingredients. Homogenize nuts, seeds, garlic, stir in remaining ingredients. Form into loaf dehydrate for 1 hour. Remove and top with BBQ dehydrate for additional 2-3 hours. The idea for tonight's experiment in raw food has been kicking around for a couple of months in our notebook. It's fun to scroll back in time to find an offhand scribble in the margins that says "raw spring rolls = daikon" and then work backwards from that tiny clue. 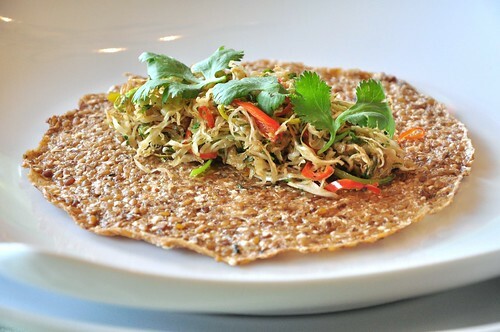 There's some tweaks I want to make to the spring roll wrapper -- which used pureed daikon, flax seed, water, agave, garlic, ginger & salt -- so next time we'll have a better idea about a recipe. They were spread out in rounds on the dehydrator sheet and they took about 2 1/2 hours. They were filled with thinly sliced cabbage (on the mandoline), red bell pepper, leeks, cilantro and tossed with a mix of olive oil, garlic, ginger, agave, nama shoyu and pepper which was dehydrated for 3 hours @ 105F, tossing a couple of times. One of the ideas to make the next time would include a sweet and sour dipping sauce for the spring rolls (orange/agave or plum/agave/vinegar). While thinking of a side-dish, I spied a lovely butternut squash that had a very round top section and thought they would make ideal gyoza wrappers if cut thinly on the mandoline, coated with olive oil and salt and then vacuum-seal them for 24 hours to compress further. This had the desired effect, and made them very flexible and easy to stuff and, more importantly, fold. It also made them very much like wonton wrappers, especially when chewing, with a good mouthfeel. This all looks so delicious. Really yummy. burgundia wrote: This all looks so delicious. Really yummy. Thank you for your visit burgundia.Stay tuned. 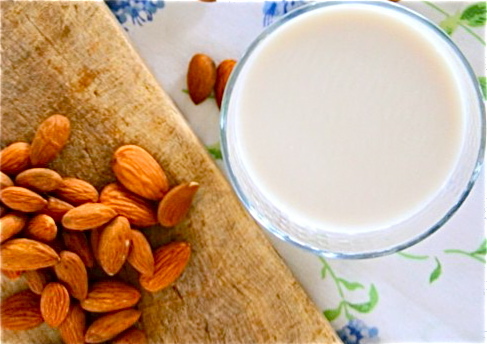 To make raw almond milk blend the soaked almonds with the water until smooth. Then strain the mixture through a sprout bag, cheesecloth, or strainer into a big bowl. Save the almond pulp in a container and put in the refrigerator for later use. Put the almond milk back into the blender carafe and blend in the vanilla seeds and dates or other sweetener until smooth. This milk will last in the refrigerator for about 3-5 days. Shake well before using. Variation: Blend in a banana and use a pinch of nutmeg to make a festive rawnog. Drink as is, or put the almond milk back into the blender and blend in vanilla, dates, or other sweeteners such as honey or stevia. Save the almond pulp for cookie or cracker recipes that require almond pulp or almonds. Put 1 or two pears through the juicer where it is added to the almond mils. Measure 1 cup almonds soak the almonds in water overnight or for at least 6 hrs. Thanks to add up to the thread. 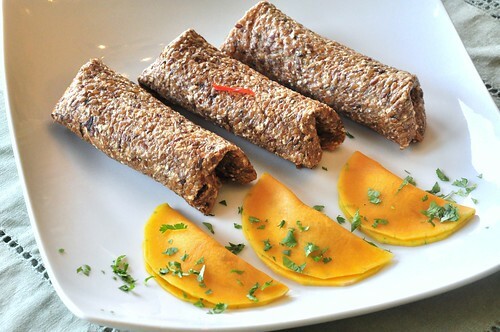 Raw food is wonderfull. Nature only wants to help. The wonders of nature - amazing! Thanks Mudra, this is nice variety. Since ~ thanksgiving we are crazy about Kale and always asked for. Clean kale thoroughly, rinsing the leaves in several changes of cold running water. Strip leaves off stalks; discard stalks. Transfer to a serving dish or mixing bowl. Drizzle on enough lemon juice, massage leaves and let it stay for a few minutes. Lemon will 'boil' leaves to become soft. Drizzle olive oil to coat, tossing leaves gently. Add garlic and salt to taste. Mix in tomatoes, seeds, croutons and cheese. Or add any type of veg you like.